Hereafter (2010). 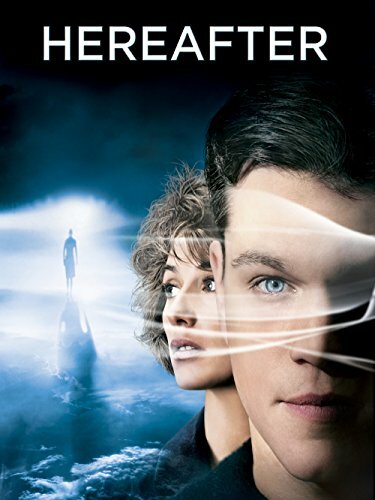 A movie about a TV reporter's near-death experience, the gift/curse of a psychic, and a boy and his twin. Very few spoilers. The movies Clint Eastwood directs and produces -- would never have expected a film like Hereafter to be among them. I discovered it at a book fair here in Bucharest, rummaging through a large crate of DVDs. Saw it was directed by Clint Eastwood and starring Matt Damon, and decided on the spot it was worth seeing. 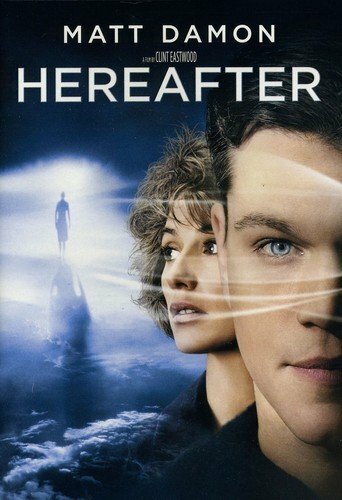 I didn’t pay much attention to the title, Hereafter, or the artwork on the DVD case, showing little white figures meant to be us in the afterlife. Then, a few days later, read about the life between lives in Dave Stone's article here on Wizzley, and decided to see Hereafter. I was pleasantly surprised while seeing the film, although not about the treatment about the "hereafter" theme. But more about that later. Throughout most of the movie, screen time alternates between three distinct storylines: one about a French journalist who has a near-death experience during a tsunami in Asia, another about two twin brothers living in London, and yet another about a psychic turned blue-collar worker living in San Francisco. As expected, the three plotlines come together at the end. A little too fast, but it’s make-believe land, and in that land, it makes for a satisfying ending. The actors are all perfectedly suited for this kind of film. Somehow in a Clint Eastwood film, whether he acts in it himself or not, faces remain imprinted on my mind as if I had been watching them in slow motion. It happened in Gran Torino, The Bridges of Madison County, and other movies of his. Same thing here. Every single moment on screen has an impact. That’s Clint Eastwood’s merit as well as the actors'. What else bears his mark in this film? Well, the one-on-one scenes between lovers, would-be lovers, and brothers; the way in which emotions unfold; the way emotions carry the scenes; the pace of the scenes; every single gesture of the face and body. I would also like to mention here the way dialogue is connected to the expression of emotions, but I found that there was more dialogue than I had come to expect in a Clint Eastwood film. Some of it, a lot of it in fact, is in French, too. And there are bits in English that don't quite fit the mood. They sounded carefully chosen to fit the mood, but somehow they didn't pull it off for me. They're all in Matt Damon scenes. They are few and far between, however, so the general impression remains that, with the exception of the treatment of hereafter (see below), which doesn't quite fall in the purview of this director's interests, this movie has Clint Eastwood written all over it in the best of ways. Matt Damon didn’t need to prove his chops and yet he was surprisingly good as a man fighting his gift/curse or being able to get “connections” with the deceased. The boys, Frankie McLaren and George McLaren were so good, their moments on screen could have been lifted directly from life. I can’t imagine how one reviewer on imdb could write that “there is no heart in this movie; none,” or that “with intonation that seems to be like that of boys being forced to read for the part of a daisy in the middle school play, the boys mumble their words.” Yes, the movie was slow-paced; yes, there wasn’t high-pitched acting; but the heartbeat was there in every frame and restrained gesture. Ironically, where you could say the movie was lacking was in discussing near-death experiences themselves! Cécile De France did a great job acting the part of someone who saw the “hereafter” but the script and the visuals really didn’t do much besides reinforcing stereotypes about blurry human-like forms in la-la land. There was some talk of weightlessness, yes, and how you could be anything and everything at once, but these and others were random ideas thrown together that didn’t amount to an evocative whole. There are many books out there with people describing NDE (I haven’t read many myself, which is partly why I expected more from this movie; but then again, I imagine people who have read them or experienced NDE also expected more). The dialogues, visuals, and music could have been integrated better to suggest such an experience, however unreal and difficult to imagine it might be. But other than that, wonderful scenes and food for thought. I don’t want to give too many spoilers, but here are some: Marcus at the tube station, losing the cap he wears; the cooking lesson and what it has to say about George (Matt Damon) the psychic, his relationships, and his life; the boys trying to protect their family from the intrusion of social services; the wonderful photo shoot that says so much about the boys’ personalities and relationship to each other. If you have two hours to spare, I suggest you see this movie. For its humanity. I remember the movie but don't remember the scene you mention. Maybe I should watch the movie again. Which I'll do at some point since I have the DVD. Mira, It's an entertaining film, and it's charming to see the familial commitment of the twin to his brother and to his mother as well as the lasting impact of the tsunami, as more than being in the "right" place for the "right" big story, on the Frenchwoman. I found particularly poignant and prescient the scene where Matt Damon's character is trying to talk Bryce Dallas Howard's character out of a psychic read. Yes, it's definitely worth watching! Thank you for your comment, Jennifer! I love Clint Eastwood movies, but I haven't seen Hereafter. Based on your review I'll add it to my list to watch should the opportunity arise. I can imagine it's not perfect, but still worth checking out. Clint Eastwood has made some really good movies over the years so I was going to watch Hereafter anyway. However, I enjoyed tour review (but avoided the spoilers :) and the posotive feedback. Thank you, Tolovaj, for your comment. I agree about Clint Eastwood. As for movies, oftentimes I don't have much time for them either, but luckily with DVDs I can watch them in segments. And every once in a while I discover one that I feel stands out in some way. Hereafter is one of those films. Thanks for heads up, I'll definitely put it on my to-do list! It was The End of the Affair (1999) and The Quiet American (2002), the movies, which got me really interested in Graham Greene. I can’t wait to read the books. Wonderful small movie: great performances, a perfect pace, and a masterful selection of scenes and dialogues, building on an intelligent and vibrant book by Nick Hornby.